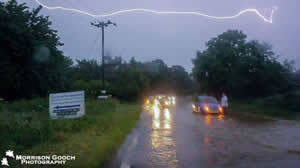 Torrential rain played havoc with traffic and caused local flooding as severe thunderstorms dropped a month's worth of rain in less than an hour on Thursday 23rd June 2016. East Anglia and Southeast England bore the brunt of the storms. Very warm, moist air from the Bay of Biscay provided the energy for these storms, which became more intense towards the latter part of the day and into the early evening. Whilst we are all accustomed to short sharp showers, the nature of these storms meant that they were not only heavy, but also long lasting. The graph of rainfall rate (mm/h) shows the peak event at Weatherquest, located at the Enterprise Centre on the UEA campus in Norwich, during the evening. The times are labelled in UTC, or 1 hour behind BST, so roughly between 7.23pm and 7.58pm giving 48mm in 35 minutes. The peak rate exceeded 200mm/h, which does happen in heavy showers, but usually only for a minute or two. On this occasion, rates maintained at near or above 100mm/h for over 30 minutes. The fundamental problem with this type of event is that even the best drains would be hard pressed to shift such a huge volume of water in such a short period of time, and temporary flooding is almost inevitable. To give some idea of the scale of storms such as these, the tops of the thundercloud may have reached higher than 45,000ft from a 5,000ft base, so 40,000ft tall (7.5 miles) and with updrafts within the cloud of around 100mph, it's no wonder such huge quantities of water can be held aloft.